Used during Facial treatments either following extractions to kill bacteria on problem skin and assist in the healing process; and/or to enabling product penetration by increasing the temperature of the tissues. 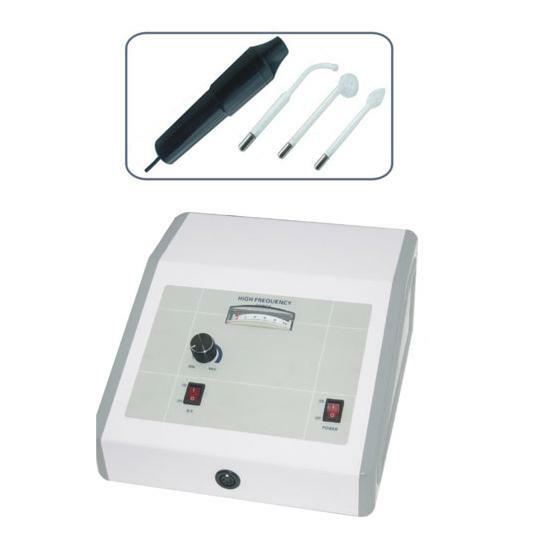 The high frequency machine's function is to generate a rapidly oscillating current (Tesla current) that is transmitted to the skin of the client via glass electrodes. The current heats the skin and improves circulation. It also increases the absorption rate of skin products and acts as a germicide to kill harmful bacteria. Assess the client’s skin concerns and conditions. 1)	Effluvation- contact treatment with one of the glass electrodes designed to raise the temperature of the skin. Ideal for all skin types and concerns especially; mature, dry, aged skins. 2)	Spark treatment- the glass electrode is held a very short distance from the skin to create a ‘spark’ the electrode needs to be moved around the area, so as not to burn the client. This produced a drying and germicidal effected to the treatment area with a gentle level of warmth. Ideal for oily skin with break outs. 3)	Saturation- the client holds the glass electrode and their entire body become saturated with the current. The therapist then treats the area of concern with fingertips and hands. The sensation is immediately felt under the areas of contact. ( the client needs to be holding the electrode before it is turned on). Ideal for mature, dry, aged skin and those that are unsure of direct contact. Place the desired electrode into the hand piece. Place one finger onto the glass electrode and press the start/ pause button on the High Frequency console. DO NOT BREAK CONTACT WITH THE ELECTRODE’ place onto or above the client’s skin and remove your finger by sliding it onto your client’s skin. You must maintain contact with the client at all times. All treatments should start with a mild current (1 or 2) and gradually increase to the strength needed. The length of the treatment depends upon the condition but generally three to five minutes should be sufficient. •	After cleansing the area apply the desired cream/serum/ointment to the area. •	Ensure that you have contact with the electrode and turn the High Frequency Machine on by pressing the start/pause button on the console. The intensity should be set to 0. •	Gently place the electrode onto the client skin and slide your finger off, Massage the area by sliding the electrode across the treatment area. •	Adjust the intensity as needed. •	At the end of the treatment. Reduce the intensity to 0, slide your finger onto the electrode and lift it from the client’s skin. •	Turn the high frequency machine off by pressing the start/pause button on the console. •	Cover the client’s eyes with damp pads. •	Gently apply the electrode to the desired area and slide your finger from the electrode. •	Tap the electrode over the desired area DO not sit in on the area of concern. •	The treatment Tap should be less that 10 seconds on total time. •	It is normal to see ‘sparks’ coming from the glass electrode during contact with the skin. •	At the end of the treatment. Reduce the intensity to 0, slide your finger onto the electrode and lift it from the client’s skin. •	Turn the machine off by pressing the start/pause button on the console. 3)	Saturation- the client holds the glass electrode and their entire body becomes saturated with the current. The therapist then treats the area of concern with fingertips and hands. The sensation is immediately felt under the areas of contact. ( the client needs to be holding the electrode before it is turned on). •	Apply a little talcum powder to the client’s hand that the electrode will be in. •	Place the electrode in to the clients hand and ask then to gently but securely hold the electrode until the completion of the treatment. •	The current will be saturation the entire body so ensure that there is will be no chance of the client coming in contact with metal. •	Ensure that the client has contact with the electrode and turn the machine on by pressing the start/pause button on the console. The intensity should be set to 0. •	Increase the intensity slowly on the machine. •	Commence Massage on the treatment area using the therapist’s hands, fingers only. •	Stimulates circulation of the blood. •	Assists in elimination and absorption. The unit contains a hand piece and 3 electrodes. The current is regulated via an intensity control and the electrodes are placed in an insulated electrode holder (hand piece) for use. The electrodes are made of glass and come in three shapes – mushroom, hook and spoon tip. They are filled with neon gas and when the current flows, the gas glows with a red-orange tinge. •	Clients should remove jewellery. •	Clients must not come into contact with any metal objects. •	This function should not be used for clients that are pregnant, suffer from epilepsy, have a pacemaker or metal implants. •	This function should not be used with products that contain alcohol such as an astringent. •	For hyper sensitive skins gauze can be used over the Face to reduce the contact spots. •	Turn of the machine both on the console and at the power supply. •	Remove the glass electrode from the hand piece. •	Clean the after every use by washing the electrodes in antibacterial soap and Hot water, do not allow it to soak for an duration of time as this will rust the metal connector. •	Dry the electrode with paper Towel. •	Spray with hospital grade disinfectant following solution guidelines. •	Ensure the electrode is completely dry before storing in an air tight container until next use. •	Ensure that the metal part of the electrode is not immersed. •	Do not place electrodes into a sterilising machine or autoclave. •	Wipe the hand piece with hospital grade disinfectant.